Several unsuccessful presidential nominees have in fact been renominated by their parties for another try. Most have not succeeded on the second attempt either. One of these, Republican Thomas Dewey, ran against President Franklin Roosevelt,and President Harry Truman of the Democrats, an unenviable task for any man. Thomas Dewey was just in the wrong place at the wrong time, but he was an interesting man. If he had a weakness as a presidential candidate it was his foreign policy, but that evolved and in his second attempt he was much more of an internationalist. The Republican Party made him their nominee to run against sitting presidents twice. Once in 1944 against FDR and again in 1948 against Harry Truman. Dewey was a leader of the liberal wing of the Republican party. He fought the conservative faction lead by Robert Taft. He was born March 24, 1902 in Owosso, Michigan. Dewey aspired to a professional singing career and had an excellent baritone voice. He had throat problems and decided instead to become a lawyer. Dewey served for many years as a prosecutor and District Attorney in New York City. His nickname was “Gangbuster” for his work against organized crime in the 1930s. Dewey’s reputation carried him to the governorship of New York state in 1942 and he was elected three times in total. He was a strong supporter of the death penalty while governor. During his 12 years as governor over 90 people were electrocuted under New York state authority. At age 36, in 1940, he ran for the Republican presidential nomination against Wendell Wilkie who went on to lose to FDR. Dewey won the nomination in 1944, but was defeated by FDR. He was the first presidential candidate to be born in the 20th century, and also the youngest man to ever win the Republican presidential nomination. Had the public known about the true state of FDR’s declining health, Dewey might well have won the election. However, that’s another story. In the 1948 election against FDR’s successor Harry Truman, he was almost unanimously projected to be the winner by all the so-called experts. 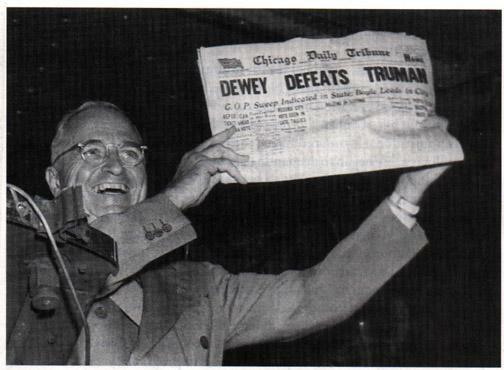 The Chicago Daily Tribue actually printed several hundred copies declaring “DEWEY DEFEATS TRUMAN” before election returns showed Truman had won. Dewey didn’t run for president again, but in 1952 he played a major role in securing the nomination for Dwight Eisenhower. 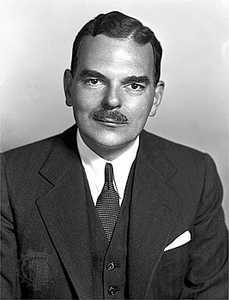 Thomas Dewey is the only Republican to be nominated for president twice and lose both times. He is also the last presidential candidate to wear permanent facial hair, in his case a moustache. His last term as Governor of New York expired in 1955. After this he returned to his law practice. He died suddenly of a heart attack on March 16, 1971 while vacationing in Florida. He was 68 years old. This entry was posted on Sunday, August 3rd, 2008 at 2:04 pm and is filed under election, history, presidency, united states, usa. You can follow any responses to this entry through the RSS 2.0 feed. You can leave a response, or trackback from your own site. Greetings! I’ve been reading your weblog for some time now and finally got the bravery to go ahead and give you a shout out from Atascocita Texas! Just wanted to tell you keep up the good job! Yes that’s one of the things that I love about history is the characters involved and how they reacted to the situtations they faced. As you say it gives us insight into societal changes – the norms of yesterday vs today. I really enjoy your posts on candidates/presidents- and seeing how things have changed over the years. I suppose since society evolves, our choice for president must change too- what leads people to run for office, what habits they have, and so on. It fascinates me how people as a whole can alter so quickly, in just a couple of generations. I think that’s why I like history so much- we’re different to those in the past, yet the same if we look hard enough. I find it interesting to look at the lives of those who came close to being President. Most were most able candidates who would likely have filled the office admirably.